An ecosystem consists of all the organisms living in a community, as well as the abiotic factors with which they interact. Ecosystems range from a microcosm, such as an aquarium, to a large area such as a lake or forest. Regardless of an ecosystem’s size, its dynamics involve two main processes: energy flow and chemical cycling. 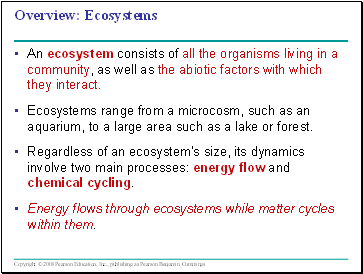 Energy flows through ecosystems while matter cycles within them. 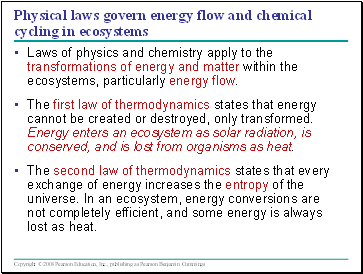 Laws of physics and chemistry apply to the transformations of energy and matter within the ecosystems, particularly energy flow. The first law of thermodynamics states that energy cannot be created or destroyed, only transformed. 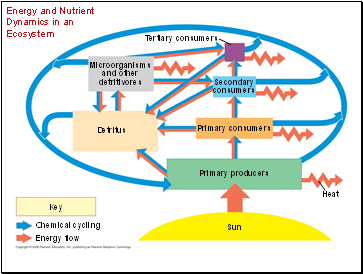 Energy enters an ecosystem as solar radiation, is conserved, and is lost from organisms as heat. The second law of thermodynamics states that every exchange of energy increases the entropy of the universe. In an ecosystem, energy conversions are not completely efficient, and some energy is always lost as heat. The law of conservation of mass states that matter cannot be created or destroyed. Chemical elements are continually recycled within ecosystems. In a forest ecosystem, most nutrients enter as dust or solutes in rain and are carried away in water. 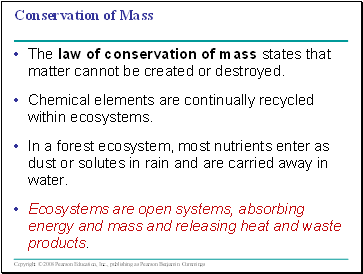 Ecosystems are open systems, absorbing energy and mass and releasing heat and waste products. Autotrophs build organic molecules themselves using photosynthesis or chemosynthesis as an energy source. Heterotrophs depend on the biosynthetic output of other organisms. 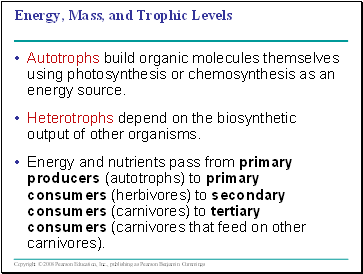 Energy and nutrients pass from primary producers (autotrophs) to primary consumers (herbivores) to secondary consumers (carnivores) to tertiary consumers (carnivores that feed on other carnivores). 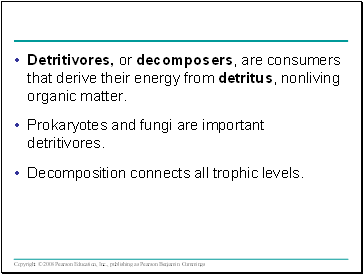 Detritivores, or decomposers, are consumers that derive their energy from detritus, nonliving organic matter. Prokaryotes and fungi are important detritivores. 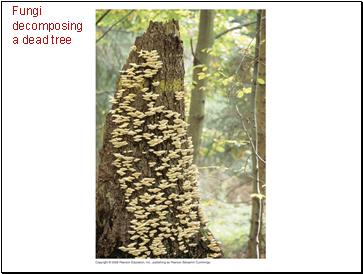 Decomposition connects all trophic levels.